Gentiana.�Sometimes called Felwort, or Baldmony. Though the foreign Gentian is principally used, yet there are two kinds in this country, which equal that imported. The greater of the two has many small long roots deep in the ground, and abiding all the Winter. The stalks arc of a brown�ish green colour, two feet high if the ground be fruitful, having many long, narrow, dark green leaves, in couples up to the top; the flowers are long and hollow, purple, ending in fine corners. 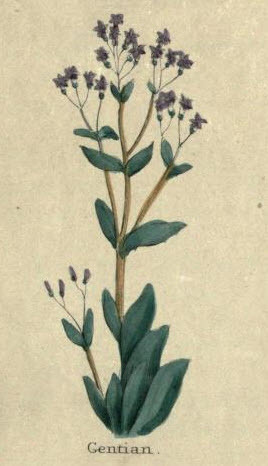 The smaller sort grows with several stalks, not a foot high, parted in several small branches, whereon grow small leaves together, very like those of the lesser centuary, of a whitish green colour; on the tops of these stalks grow blue flowers, standing in long husks, but not so large as the other; the root is very small, and full of threads. They resist putrefactions, poison, and a surer remedy cannot be found to prevent the epidemic diseases; it strengthens the stomach exceedingly, helps digestion, comforts the heart, and preserves it against Paintings. The powder of the dry roots opens obstructions of the liver, and restores the loss of appetite. The herb steeped in wine, and drank, refresh such as be over weary with travel, and lame in their joints. It relieves stitches, and griping pains in the sides; it is an excellent remedy for such as are bruised by falls; it provokes urine and the terms; but should not be given in pregnancy. A decoction of it is very useful in cramps, convul�sions; in stone, rupture, and in cold diseases, and to such as are troubled with tough phlegm, scabs, itch, or sores and ulcers. It is an admirable remedy to kill the worms, by taking half a drachm of the powder in a morning in any convenient liquor; taken inwardly it is good for the king's evil. It relieves agues, and the yellow jaundice, as also the hots in cattle : when kine are bitten on the udder by any venomous boast, only stroke the place with the decoction of any of these, and it will instantly heal them.